When an anonymous note sends a newlywed wife looking for help, Miss Sherlock Holmes and Dr. Dorothy Watson work together to uncover the secrets surrounding a corrupt police inspector whose wives have a habit of turning up dead. But this Holmes and Watson face far greater challenges than bringing the cunning criminal to justice. 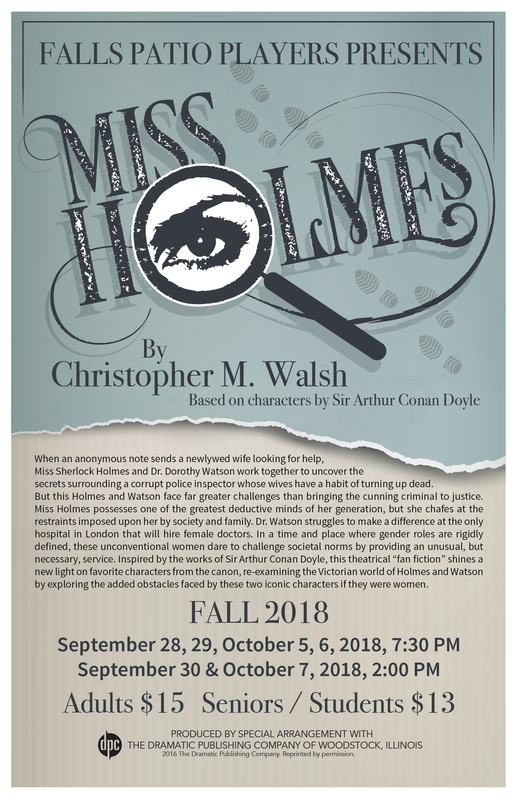 Miss Holmes possesses one of the greatest deductive minds of her generation, but she chafes at the restraints imposed upon her by society and family. Dr. Watson struggles to make a difference at the only hospital in London that will hire female doctors. In a time and place where gender roles are rigidly defined, these unconventional women dare to challenge societal norms by providing an unusual, but necessary, service. 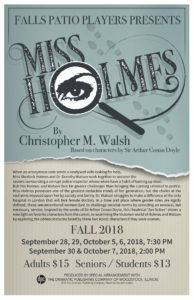 Inspired by the works of Sir Arthur Conan Doyle, this theatrical “fan fiction” shines a new light on favorite characters from the canon, re-examining the Victorian world of Holmes and Watson by exploring the added obstacles faced by these two iconic characters if they were women.